"The Purpose of this CD is to lift our perspective to a dimension that cannot be perceived by the natural eye. It is a heavenly realm, a place where joy and peace are not simply ideals to be spoken of and pursued but are realities that are experienced every day. The central figure in this heavenly realm is Jesus Christ. He is the only way, the only door into this place of joy and peace. To answer His invitation is to enter into a life that will last for eternity, but also a life that begins today. If God uses this music to point just one person to the Remedy, then we have succeeded." 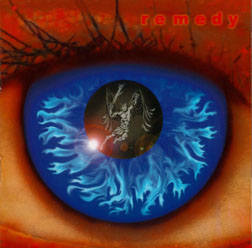 Remedy is made up of four brothers: David, Philip, Daniel and Paul Zach, who range in age from 17 -21. This is their second album of songs. The Zach brothers are very accomplished musicians on both their instruments and their ability to sing with feeling; in harmony no less. Their use of dynamics, and musical ability to illustrate their songs in musical pictures is really quite impressive, in such songs as DESERT FLOOD.. Interesting rhythms and percussion rifts spice up their songs nicely, making them all uniquely different. Besides being able to sing and play extremely well, two members of the group, David and Philip, have a lot of talent in writing lyrics. The foundation of each song is based on scriptures, listed by each song. Most of the lyrics of the songs on this album were written by David Michael Zach. Philip Zach wrote the lyrics to the song, CLEFT. Using the scriptures as his guiding force, David makes the message of each song a personal reflection of the Remedy band, and creates the lyrics to illustrate the truths which come from each verse listed by individual songs. Philip Zach's song, CLEFT, is a unique prayerful praise song, also based on scripture, that has verses that can be sung together, creating an interesting choral intertwining of voices, creating a truly glorious, intricate praise song. The resulting songs call others toward having a relationship with the Lord, the Remedy, inviting listeners to seek a relationship with Him, and encourage believers in their own relationship with Jesus. The songs explore who Jesus is, why he is the Remedy, what he offers His believers, that can't be received by any other way, and offer a glimpse of what believers have to look forward to with eternal life with Jesu, in the present and the future. PERFECT PLACE - Based on Hebrews: 10:19-23, Hebrews 4:16 - The music in this song offers an interesting blend of acoustic guitars with electric guitars, on and off the beat(syncopation), steady rock beat, which complement each other to give the listener a nice interesting inter-connectedness to the sound. Because Jesus was our ultimate sin sacrifice (Hebrews 10:10-14), dying for our sins on the cross, we can directly enter into God's presence, by the blood of Jesus, with confidence to "receive mercy and find grace to help us in our time of need." Lyrical Sample: 1) Would you take a seat in heavenly places, turn around and remove your shoes from your feet, if you want to stand on holy ground? Chorus: Come enter in by a new and a living way, don't cast away your confidence now. We can begin to come boldly before the throne, the perfect place this grace will allow. Can you hear the news form a nation that you have never been to? Can you hear the distant echo of a tune you've never heard? FIRE EYES - Lyrics by: David Michael Zach.- A favorite of this reviewer. The music starts off with a nice rock beat, electric guitars. Not only can they sing in harmony in this song, but they can clearly Rap with terrific diction, to a rapid beat, on two different pitches, harmonizing at the same time! Based on (Rev. 12:11, 1:13-14, Daniel 10:6, Luke 4:5-8, LUKE 22: 31-32. (Jesus resisted temptation): Talks about the ever present fight we all have against temptation. Believers can be empowered to resist or flee from temptation through the blood of the lamb(Rev.12:11). We can resist our sinful weaknesses and anything that the Prince of the air can throw at us, through dependence on Jesus who empowers us with the ability to stand firm, through the Holy Spirit. The Title, FIRE EYES is taken from Rev.1:13-14, where it describes a fully glorified Jesus, and from Daniel 10:6, where a heavenly being (some say it was Jesus) is described as having eyes like flaming torches. Chorus: For there's a flame that's in my eye and so I'll stand. They overcame and so can I, by the blood of the lamb. 1) Temptation's pretty eyes come knockin' at my door, saying I'm gonna rip your hear out, trade you hope and peace for pain. Might seem strange I say, but that doesn't sound like fun. I want to overcome and you can't take away my fire. This song is a favorite of this reviewer. Music starts off with acoustic guitar, light drums. Piano joins in. Great use of dynamics, builds nicely to full sound. Uses the piano, acoustic guitar light drums for first stanza and chorus. Electric guitar joins in, with heavier drums. Dynamics are perfect . Starts off with one voice, harmony of one other joins in at the chorus. Others slowly join in to full sound of all four in beautiful harmony. After the lead singer sings all three verses, the lead singer sings the first verse, while the secondary singer sings the second verse. After the chorus, All three verses are sung together. Then all three sing the 3rd verse together, which creates a truly uplifting song. Chorus 2: Glory shining in my soul now, will it change my life say somehow. Glory shining in forever, will it pass me by say never. 3) I'm walking in the light so occupy my sight so I can see your glory. I want to live for you so change me like you do so they can see your glory. BALM - Jeremiah 8:20-22 - Quiet song - Piano chords, acoustic guitar, light percussion, that builds and then quiets down again. Nice electric and acoustical guitar and piano solos at the end. An Invitation to the weary, who need a Savior. It is contrasted to the Jeremiah passage, which is full of the pain from the results of rebellion. When distressed, believers can count on the love and mercy of the Lord to get them through their storms. Lyrical Sample: Is there not a balm in Gilead? Is there no physician there? Where is the calm and still she had a bleeding heart and an empty stare. Chorus: Come back home to glory land my love, angels wait to celebrate. My kingdom's gate is open to the heavy soul, so cast your cares. You'll find some comfort here my love, Take refuge in my loving care. I'll carry you on eagle's wings, far from distress and far from despair. In a 6/8 time, swing feel to it - Music is descriptive of a rain storm, starting with electric guitar / synthesized piano imitate the rapid falling of raindrops, starting off at the beginning, which flows through the song. Electric guitars also support the rhythm of the drums. The ending measures quiet down to just the synthesized piano imitating raindrops. A prayerful song that starts off praising God for saving him through Jesus (the living water). It goes on to ask for forgiveness, guidance and the ability to see the truth. Lyrical Sample: 1) In a dry and thirsty land where no water is, you said I'll find you here within my desert sand. You kept my soul from death, now keep my feet from falling that I may walk before you in the living land. Chorus 1:Then I'll be in the land of the living, then I'll stay in a world without end. 2) You know my wandering heart, my sins are ever before you in the back of the desert., with the wool pulled over my eyes....Turn again the joy to the boy with the world pulled over my eyes. Chorus 2: Then I'll be in the land of the living, then I'll stay in a world without end. Would you take me to fountains of glory and hidden manna, then I'll stay in a world without end. BEHIND THE SKIES - (LUKE 16: 23-31) - Easy rock beat, nice guitar work, nice diversity in dynamics, combinations of instruments. Jesus is talking to an unbeliever, or someone sitting on the fence. Lyrical Sample: 1) Would you listen to an angel if one came? If thunder called and hear it say your name? Signs in the sky tell me would you still reply the same or would you still deny my glory? Chorus: Come see my mercy unveiled before your eyes, the free souls can see and sail behind the skies. 2) If you break my laws then indifferently go on, then toss my name with the trash coming off your tongue, do you think when I come again that I will say 'well done'? No, I'll deny you my glory. MARTYR SONG . (Hebrews 11:36-40) - Piano, acoustical guitars, drums. A song of self-reflection about the ultimate price of belief, dying for the sake of Jesus. Lyrical Sample: 1) To the many faithful that have fallen by the sword, some tied to flame and some in prayerful huts or One crowned with thorns and pierced with nails, my Lord. Is what I'm living worth dying for? Chorus: Is what I'm living for worth dying for? You can take my body, you can break my bones but you can't take my soul. Westwood Terrace (instrumental) An interesting, intricate piece, which flows into the next song, DEEP CENTER REST. DEEP CENTER REST - Lyrics are taken from a poem by George Geftakys, which was a meditation on Matthew 11:28-30. "Come to me, all you who are weary and burdened, and I will give you rest. Take my yoke upon you and learn from me, for I am gentle and humble at heart, and you will find rest for your souls.For my yoke is easy, and my burden light." . Features a single acoustical guitar, and the beautiful harmonic singing of the group members. The last singing of the chorus is done with no music, accapella, in perfect harmony. Chorus: DEEP center rest my child, in the mist of a rising tide, peace be still, and with peace will flow the depths with a crystal sea. 2) This inner harmony as quiet as a dove, as impervious as a diamond, the beauty of my quest an infusion of your rest, the stillness of so many waters deeply flowing. Steady Rock beat, piano, electric guitar, percussion. An impressive piano solo /duet , electric guitar at the end of the song. Lyrical Sample: 1) Upon a hilltop is a city with walls built of fire, for a glory - for a defense - for inside her walls requests are rising higher. Angels enter glory on a ladder stretched from earth. She answers every gaze in sapphire vision etched with worth. Descends a city and she's arrayed in light. The day has dawned when you shall take my name. She's set apart. She's clothed in radiant white. The day has dawned when I call you mine for I Am. The same yesterday, today and forever. THE CALLING (Hebrews 6:18, John 14:3) - Upbeat song that really cooks! Interesting, varied rhythmic beats, carried by guitars and drums, that flow in the background supporting the vocals. Nice electric guitar solos toward the end of song. God's promises are true as He can't lie. This hope of glory is true. Jesus has prepared a place for each of his believers. We have this to look forward to. Lyrical Sampling: 1) My friend, do you search for hidden truth? You know that you can share in a mystery. Would you take the hand that calms all fear? My God can open blind eyes and deaf ears. Chorus: Hear the calling of the ages, more than a story this hope of Glory here to stay. Turn in the pages turn to forever, turn to and never turn away. Believers are built up by the word of God's grace and will receive an inheritance as a reward from the Lord, even though we don't deserve his gift. We have free will to choose to believe or not. Lyrical Sample: 1) I have presumed upon the grace, the expression of your favor, free to me so undeserving. At times I cannot see your face, still the promise doesn't waiver. There is nothing you're reserving. You can inherit everything. Once orphaned - cold in darkness, now an heir in warmth and sunlight. You have seen, you've been given everything. Then why are you living like a beggar, choosing blindness over sunlight. Chorus 2 - I can hear a still small voice, saying join me in my destiny. I'm always near - it is your choice, come and join me in my destiny. I'm always near - it is your choice, come and join me in my destiny. Reviewed by Julie Carr for ChristianMusic.com.